This widget is for adding labels or other static information to a form. Since IJC 5.4 image files (e.g. company logos) can also be displayed by the label widget. The size limit is however 50kB. Multi-line text is also supported. The user should first add a label widget as normal. Then edit the settings and when editing the 'Text' property you can specify muli-line text. To edit the settings in Design or Browse mode double click on the Widget and the settings editor will open. Alternatively select the widget in either mode by single clicking on it and then click on the Widget Settings icon ( ) in the Form toolbar. 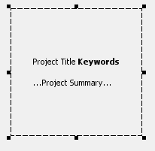 The text that is displayed and the font details and alignment can be edited. Label widget also supports setting up a custom clickable URL for the label. You can set this up when creating the Label widget. The screenshot should be self-explanatory. 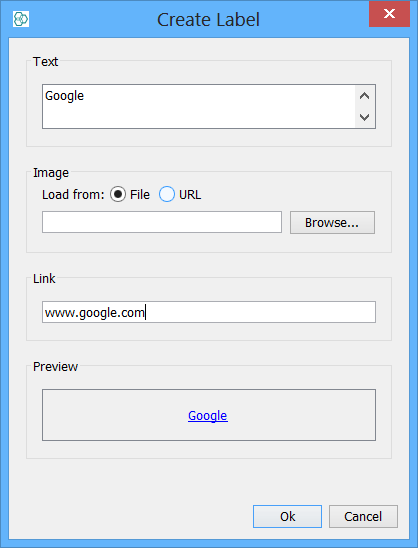 Setting up an image and custom URL will produce a clickable picture. Such as clickable company logo.